Italian philologist; born at Triest June 22, 1869; educated at the gymnasium of Triest and the universities of Pisa, Rome (Ph. D. 1891), and Berlin. He has been teacher of literature, later of classical philology, at the gymnasia of Benevento (1891-93), of Rome (1893-95), of Modena (1896), and of Parma since 1896. In 1895 he became lecturer on Greek literature at the University of Rome, and in 1896 of Bologna. 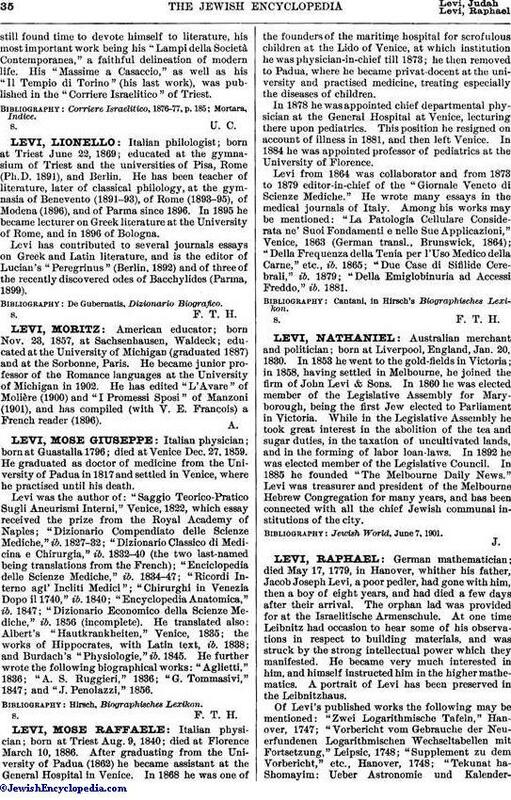 Levi has contributed to several journals essays on Greek and Latin literature, and is the editor of Lucian's "Peregrinus" (Berlin, 1892) and of three of the recently discovered odes of Bacchylides (Parma, 1899).